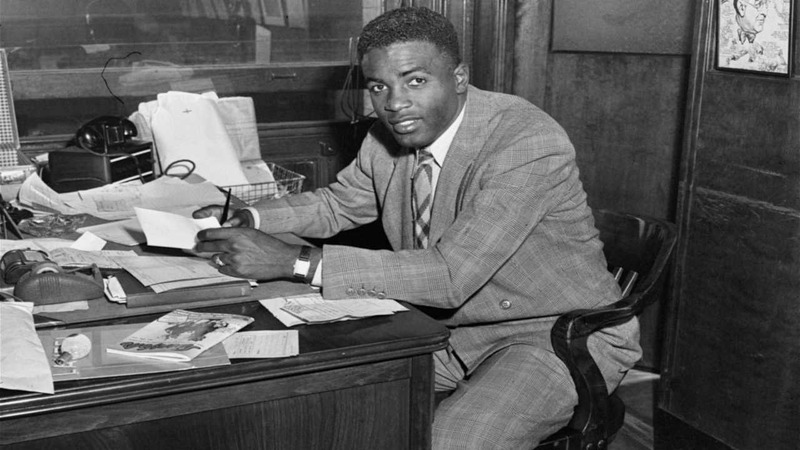 Jackie Robinson, first African American to ever be admitted into the major leagues, photographed right after he signed his contract with the Brooklyn Dodgers at the Dodgers office. MIDTOWN, Manhattan -- Jackie Robinson's contract with the Brooklyn Dodgers that broke Major League Baseball's color barrier is on public view in New York and soon in other places, as well. 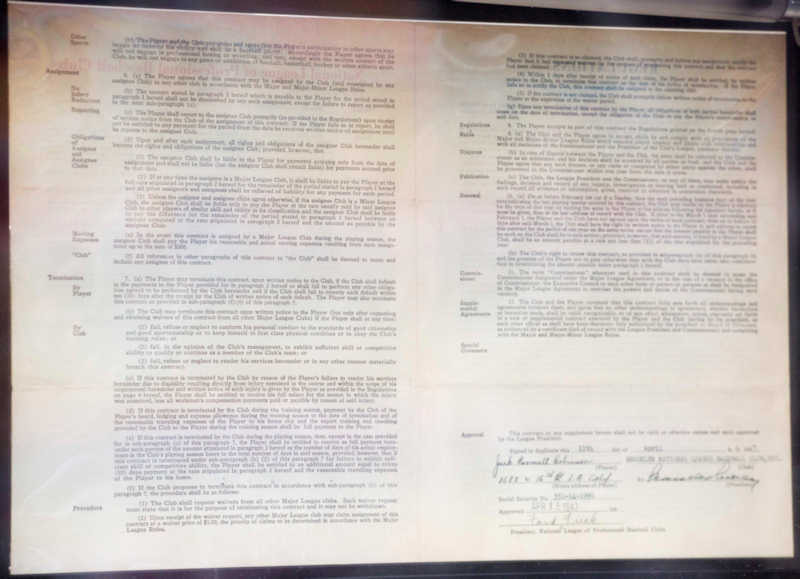 The April 11, 1947, document, together with a contract Robinson signed two years earlier with the Montreal Royals, is on display at Collectors Cafe, a new collectibles auction venture in Times Square. On Friday, the documents will move to the New-York Historical Society, where they will be on view for one week before going on a tour of other cities. "For us, the significance of the contracts is that these are the documents that ushered in a whole new era in sport history in this country," said Michael Ryan, vice president and librarian of the New-York Historical Society. "One of the themes that run through our program here is civil rights, abolitionism, slavery ... so this is right in line with our mission." The contracts were acquired by Collectors Cafe founder and CEO Mykalai Kontilai in 2013 and valued at $36 million by Seth Kaller, an expert in American historic documents. "By actually signing this document, Robinson changed history, and therefore it gets valued among the most treasured, the most valued, American documents," Kaller said. "This is miles beyond any other Jackie Robinson document. There's no sports document I can think of that approaches this in its importance and value." Kontilai said the contracts were acquired from the estate of a New York-based private collector. Collectors Cafe "sees this as a responsibility to tour them and make them available to the American people," Kontilai said. After New York, the contracts will be shown this month at the National Constitution Center in Philadelphia. They will also travel to venues still being worked out in Atlanta, St. Louis, Los Angeles, Chicago, Miami and Washington, D.C.